The glory and mystery of the royal house of Susuhunan Pakoe Boewono X is the first time being made available to the public by the inspiration of the grand children Mrs. DR.BRA. Mooryati Soedibyo. Dr. BRA. 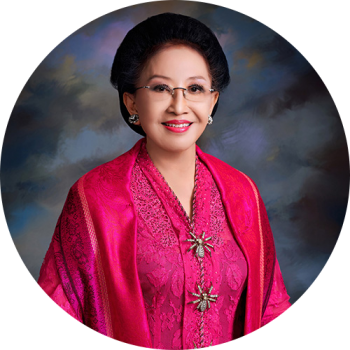 Mooryati Soedibyo is the granddaughter of Susuhan Pakoe Boewono X. Born and raised at the Javanese Keraton, she is knowledgeable of Keraton Surakarta Hadiningrat Royal Javanese tradition. From the early age she learned how to brew jamu and other traditional beauty treatment. She also learned how to play the classic Javanese Gamelan, classical dance and she is very knowledgeable of traditional Indonesia herbs and spices. With the expertise she founded PT.MUSTIKA RATU a company which manufactures jamu and traditional cosmetics from natural ingredient. Started as a home industry the company grew to be a leader of traditional cosmetics market. Along with modernization, Dr.Hj BRA Mooryati Soedibyo has a calling to reserve, restore and socialize the traditional self improvement treatment, which derived from charismatic keraton tradition with then combining the mystical keratin tradition with modern Western technology at the Taman Sari Royal Heritage Spa.